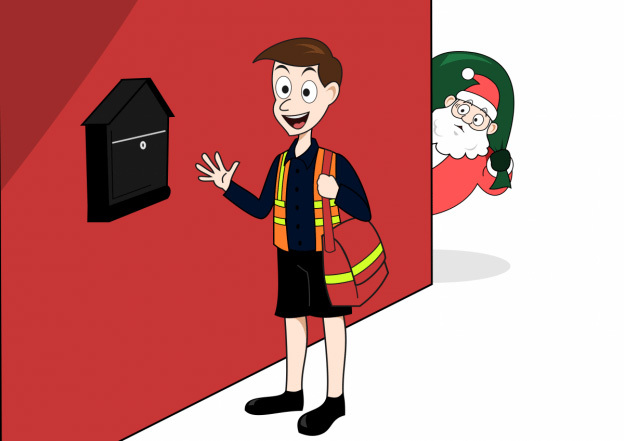 The Adventures of Post Man Gordon – Gordon saves the day! The Adventures of Post Man Gordon - Gordon saves the day! Gordon was running late; he’d dropped his van keys down the river bank which ran by the side of his house and had spent what seemed like ages, trying to pull them out of the muddy, weed infested bank with a creation he’d made from an old metal coat hanger! Finally, he hooked the keys securely onto the hanger arm and was then able to hook them up the bank and be on his way. As he drove off whistling an unnamed tune, he thought to himself how like Postman Pat he really was; all he was missing was Jess, the black and white cat! Perhaps he should get one, he mused. “Morning Claire”, he called from his window as he went about his route. “Mind you save me a Jaffa cake, if you’ve any left!” Claire was his sole supply of Jaffa cakes, which she gladly offered to him ever since he showed her the delights of the multiple letter box when she was delivering the Parish Newsletter and thought that she had to deliver each one individually to each resident of a large block of flats! By the end of the morning, all his letters were delivered but he still had a large package to deliver to Signorina Valentini, right at the very end of the village. It wasn’t usually down to him to deliver such large parcels but they were short-staffed at the sorting office and so he offered to deliver this one, seeing as it was so close to home. He drove up to Daisy Cottage but was sure no one was in. The windows were closed and Signorina Valentini’s bike wasn’t in its usual spot by the shed door. As he got closer, Gordon saw white paper flapping about in the breeze, on the grass. He jumped out of his van, but the wind whisked the paper away, down the lane. Gordon chased after the paper as he hated litterbugs and couldn’t bear to see his beautiful village spoiled by such mess! Signorina Valentini was originally from Sicily. As a child, she was taught to sew by her beloved Nonna (grandmother) and by wearing some of her fabulous creations around the village, her work was becoming more and more popular, with local women (young and old) asking her to make outfits for them. It was taking off to such an extent, she had started to order material and pattern paper online; items which are bulky and didn’t fit through her letterbox. This had become a problem as she also helped at the local primary school and so isn’t always at home when some of the packages arrived. “I’m getting too old to chase litter around the village” grumbled Gordon as he eventually caught up with the errant paper and stamped on it to keep it from moving off further. As he picked it up, he read the message. “Well I never”, he thought, “Signorina Valentini must need this package really urgently.” Gordon took the sheet back to the cottage and opened the gate. He rescued the other pieces of paper, all with the same message. “Thank goodness, I found these. It was highly unlikely the parcel service would take the packages up to the school,” he muttered to himself. Gordon got into his van and drove to the village school. The children were playing in the sunshine as he pulled his van into the car park, carefully avoiding bats and balls which had somehow found their way out of the boundary. He moved towards the entrance and pushed the buzzer to announce his arrival. Betty, the school secretary, came to the door with her hands out for the post. “Not for you today Betty. I’ve an urgent package for Signorina Valentini. Is she about?” Gordon certainly didn’t expect such a welcome as Signorina Valentini flew across the corridor. She was absolutely delighted that Gordon had been thoughtful enough to act on her note, but also told him about her concerns as to the delivery of packages when she wasn’t at home. Signorina Valentini grinned from ear to ear; she felt that a parcel box was a worthwhile investment for her business and went online to order as soon as she got the opportunity. The box was delivered within the week and once secured, Signorina Valentini received parcels galore ensuring her sewing business went from strength to strength. She was sew glad to have a friend like Gordon! It’s a bright sunny morning when Gordon the Postman reaches Scampering Paws Animal Rescue. He is very much an animal lover so quite enjoys his daily visits. His wife lives in a state of near terror that one day he will actually arrive home with a sick tortoise or a lame cat that he was unable to resist. But so far, he has stayed strong in the face of not inconsiderable temptation! Before opening the gate, he carefully checks to make sure there aren’t any loose animals that might get out. He then slides in, shutting the gate behind him. “Ooh, no. I’m fine. Thank you though.” She replies. A bright flash of orange suddenly shoots across his vision. “Woah! What was that?” He exclaims. The answer to this mystery was soon solved. As they walked up to the Kennel block they met Angie who was flapping about. “Over the top! She went over the top of the door, it’s 8 foot for goodness sake. What dog can jump that?” Apparently a very determined one that had dragged a bed over for a leg up. Gordon didn’t know whether to be impressed or slightly scared. “that is one seriously smart dog” he said. As Gordon continued on his rounds he pondered. He wondered if Shawshank had been found and returned to her kennel. And he wondered if there was anything he could do to help. And then he had an idea. Three days later he returned to Scampering Paws. “Morning gang!” he called cheerfully as he carefully slid himself through the gate, closing it firmly after him. He cast his eye about for an orange streak of dog but saw nothing. “did you get her back OK?” he asked. “She surely is. She’ll be a fair handful to take on though for her new owner. We’re just not sure she’ll ever learn to come back. But it’s early days. She has the nicest nature. We don’t give up! So as well at the rescue centre being a little bit more escape proof, Gordon also found himself a little further away from temptation not having to walk through the yard each day. However, this was rather locking the door after the horse had bolted. You see his wife decided to join him when he went to attach the letterbox and she rather fell in love with a speedy orange dog that on Saturday was on her best behaviour and dolling out cuddles and looking innocent. So, Shawshank now has a new home to try and escape from and Gordon has banned his wife from ever setting foot in Scampering Paws again. Clinton University is an esteemed educational facility and well renowned for its academic success in the Humanities, Arts and Languages. This is what parents reassured themselves with as they wrote out cheques for their offspring. Said offspring were, of course, very interested in the academic side of things but also wanted to be sure that they had rounded education and saw some of the local colour and experienced living away from home for the first time properly. Basically, they wanted to have a good time and make the most of their new-found freedom. On Oak Street one of the biggest Halls of Residence was managed by Tom. He was a caretaker, facilities manager and all round useful person and staff and students alike were very fond of him. One of his many, many tasks was taking the post from the campus to all the various halls of residence and popping them into the multiple letterboxes in each hall. The students would then, eventually, collect their mail. Tom occasionally felt the need to remind them to do this – most got almost all their correspondence on their phones by one or other method so an actual paper letter was quite a rarity. Tom recalled the days when students would queue up excitedly for their post in the main post room as it was their main connection to home. He remembered one girl had a boyfriend at home who sometimes sent her 12 letters a day! Those were the days, he thought. Now it’s just Facebook and Snap Chat and WhatsApp. No romance at all. He also remembered a time when people with a problem would have to book to see him at set times. Now, he had a work mobile and there was no escape from dripping taps, stuck windows and flooding toilets. But he enjoyed his job and often regaled his friend Gordon with tales of what the students had been up to lately. Recent pranks that contravened at least 3 health and safety rules included students dangling out of the window of the 4th floor with a clothes hanger on a string. The idea behind this was to scrape the window beneath and scare the wits out of the occupant of that room who they knew to be watching Poltergeist which was on TV. It worked. There is a wine stain on the ceiling to prove it as she jumped 3 foot in the air whilst clutching a glass of red. But most days were more mundane. Again, Tom sighed. The students seemed to more or less manage to keep hold of building keys but it was completely beyond them to keep track of the little keys that opened their post boxes. “Did it work?” Gordon asked. 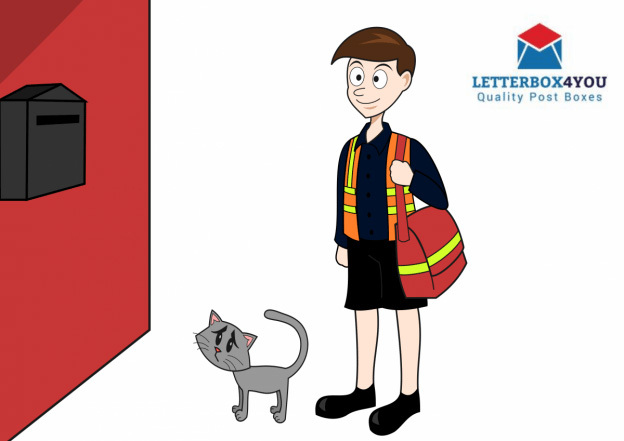 Tom put his business case to the university and the new, combination lock letter boxes were installed over the next holiday. Tom was still to be seen running about the campus, a slave to his phone and the endless list of tasks. But there weren’t quite so many post boxes in need of a spare key of tales of hauntings and mysterious disapearances. Gordon, our hero postman was doing his Tuesday rounds as normal. He’s interested to see a removal van heading slowly down the road and turning into the drive of Grey Towers, a large and secluded house set well back from the road. He has never delivered any post there. It has been empty for as long as he has been doing this round, so years. “Oh, how exciting” he thinks “how lovely to have new house to deliver to”. But despite the signs of new arrivals, there is still no post for Grey Towers. Not that week, not the week after or even the week after that. “How very peculiar” Gordon thinks as he passes by without so much as a catalogue for the new arrivals. It is in fact nearly a month before he spots in his post bag the first letter for Grey Towers. It stands out, not only because it is the first but because it is a handwritten envelope of very expensive paper. The writing is the most beautiful calligraphy and the letter is addressed to Elvira Mortova. Gordon excitedly sets off in his van to complete his rounds, looking forward to his first visit to Grey Towers. He gets to Grey Towers and sets off down the drive with some anticipation. He’s never actually seen the house itself, the drive is so long you can’t see the building from the road. As he gets to a bend in the drive, he reaches a very new-looking full-height fence and gate between him and the imposing looking house. Pulling to a stop he gets out and walks over to the gate to press the buzzer to go through. However, either the buzzer is broken, or no one is at home. He presses it a few times with no response. He gives it another moment of thought, tries the buzzer one last time and reasons that he’ll just have to try again tomorrow, he can’t leave anything out in the wet. He pops the beautiful letter on his dashboard and heads off. The following day, the same thing happens. He buzzes, no one answers, he has to give up. On day three, he is starting to feel a little bit miffed. This is as cross as Gordon ever gets, nice guy that he is. On day four, the gate opens! Gordon gives a little fist pump and scoots back into his van to drive down the remainder of the drive to the house. As he gets out of his van at the front door, he feels a little nervous. The house really is quite, well, spooky looking. The front door is vast, both in width and height and as he heads towards it, it opens totally silently in front of him. “Yes” a voice whispers and a tall, slim woman glides towards him. She’s dressed in a pale floaty outfit and is incredibly pale but has the most entrancing face. “Just my job, it’s no bother” Gordon says, she really is a stunning woman. The most amazing eyes. He can’t seem to stop looking at them. He could look at them all day he thinks, like a tiger, or maybe a lion…. “I don’t like to be disturbed” the woman was saying. As Gordon snapped himself back to attention. He was bumbling. He could feel his ears turning pink as she gazed at him calmly. He hands over the letter and she takes it so gently it is almost as if it floats out of his hand. “Go? Yes. Oh yes, thank you. I’ll go” and Gordon finds himself back at his van without really remembering moving his feet at any point. The gate opens ahead of him and he heads out shaking his head and considering giving his face a little slap to bring him back into the real world. As he goes up the drive, he looks in his rear-view mirror and to his utter amazement, sees the gate now has a letter box fixed to the outside of it. That wasn’t there before? It really wasn’t? Was it? As he heads up Broughton Street, he sees Mr Carver looking rather vexed in front of his house. This isn’t out of the ordinary, Mr Carver has decided to turn his rather large detached house into five probably rather poky flats. The building work is, as building work is wont to do, taking longer than anticipated and therefore costing more than it should. So Mr Carver frequently looks vexed as he negotiates deliveries, coordinates various trades and attempts to make everything work together. On this particular morning, Mr Carver looks rather delighted on seeing Gordon, quite possibly because it is a good excuse to stop and have a chat without the entire site team all joining in and downing tools for a brew at the least excuse. And, true to his word he came back to Broughton Street after making his last delivery, picked up Mr Carver in the van to collect the glass. And Gordon went on his way. Gordon, our heroic postman was making his rounds a little later than normal on Wednesday. There had been a power cut at the sorting office. Gordon and his colleagues had had to navigate in the dark to their delivery piles. They were aided only by mobile phone torches and one head torch which had been appropriated by Ethel and was therefore no help to anyone else as she was only 4 foot 2 so the beam shone well below anyone else’s eyeline. But Gordon was nothing if not adaptable and he set out on his rounds as cheery as ever. As he made his way up Davis Row, he realised he was catching up with a lady pulling a shopping bag on wheels who was popping things through letterboxes ahead of him. Gordon’s eyes twinkled as he held open the door in the first block of flats. “you wait” he said. Gordon certainly did like a Jaffa Cake and gratefully accepted before saying he needed to press on and keep up the good work. “Oh yes. I will, thank you. Once I’ve done another 20 I shall have earned a second Jaffa Cake” and she trotted out to the next block. Gordon the Postman was making his way up Greenhill Lane. The houses in this street seemed to have a competition to see who could put up the biggest, brightest and flashiest Christmas decorations. Number Ten was probably the current winner, Gordon mused, they had a lawn full of plastic elves with parcels, an entire team of light-up reindeer galloping across the roof and a blow-up Santa of quite epic proportions poking out of the chimney. He trotted across the lawn with his stack of mail, popped it through the letterbox and went back to his van. He repeated the process at numbers twelve, fourteen and sixteen finding on his way a collection of fairy lights, tinsel, another Santa and few stars. “I love Christmas”, he thought, humming something that may have once been Slade. At the top of the road, he drove his van into the garden centre and went in to the shop with their letters and a parcel. “No problems” and Gordon set off through the shop to the Christmas area at the back. There was no answer, so he stuck his head in gingerly, not wanting to catch the big man in the middle of getting changed. “Er?” said Gordon, not wishing to be rude. “Er” said Gordon again, feeling that perhaps he needs the coffee more than the jolly man in front of him. Or maybe a mulled wine. Was it too early for a small eggnog? And Gordon went out into the Garden Centre, dazed and not a little confused and went on with his rounds. Now elves of course are very clever and make all manner of things. But they are also geniuses in the art of outsourcing. They keep it very quiet, it’s not good for PR, but you should know that occasionally, when they want expert help with a specialist post box, they have been known to drop a note to the team at Letterbox4You to see if they can help. So, it won’t come as too much of a surprise to learn that Gordon did wake up on Christmas morning to a shiny black SD3T post box (with newspaper holder). Gordon, our hero postman was doing his Tuesday rounds as normal. It’s a perishing cold day but as always, Gordon is in shorts and fleece, moving at a cracking pace keeps him perfectly warm and he sees absolutely no point in wearing long trousers. Gordon loves people and dogs and most of them love him. An affable chap, he juggles an exceedingly busy round with making pleasant conversation to all he meets, and he still manages to get back to the depot before many of his colleagues. Friendly and efficient, his boss reckons that if he was able to clone him about ten times, the world of mail deliveries would be an altogether better place and he would sleep a lot better at night. On this particular Tuesday, he stops in his tracks as Mrs Stedman from number thirty comes hurtling down her drive towards him. Well this was all a bit odd. “Are you alright?” Gordon asks politely, trying very hard not to notice that Mrs Stedman is still wearing a what is obviously her nightwear; a saggy pair of check pajamas and an oversized, slightly greying T shirt and has her bare feet on the frosty ground. “Can I have the post?” She gasps, holding out her hand. “It’s my new bank card. I’m totally stuck without it. I only got one on Friday, but it got ruined so I need another one. I can’t have this one wrecked too”. “Horace is the new dog?” Gordon surmised, having recently heard a new dog barking from inside. “Oh, I know. We’re obviously trying to train him to play with other things but it’s really hard when a pile of his favourite stuff comes through the door every morning at 8”. The next day, Gordon is careful to ring the bell and hand the post to Mrs Stedman. He is introduced to Horace who surely is as described, a lovely dog of some indeterminate mixture of breeds, who looks quite likely to lick a person to death when he’s not busy being a one-dog professional document shredder. “I’ve ordered a gorgeous letterbox” Mrs Stedman said “It’s arriving later today! I can’t wait. It was such fun choosing one, there are so many, I’d no idea!”. And sure enough, on Thursday, Gordon walks up the drive to see a beautiful wall mounted post box attached to the wall of the Stedman’s porch. It’s a rather fancy looking thing with leaves and a newspaper holder. “Well” he thinks “That’ll sort Horace out”. And he pops the post easily into the postbox and heads back off on his rounds, smiling to himself. A range of door furniture, from door numbers including self-adhesive, to stylish knockers in cast iron or polished brass. Quality accessories made to last.